The small village of Pont-Tyweli just over the river Teifi from Llandysul, takes its name from the river Tyweli a tributary to the Teifi. Pont-Tyweli was the home of Llandysul Railway Station and Llandysul Mart and is now the home of Llandysul Paddlers. There were at least three mills in Pont-Tyweli using the Teifi and Tyweli to create electricity. The Powerhouse was built between 1921-1929. Three turbines were used to generate electricity from the River Teifi for Llandysul and Pont-Tyweli. The Powerhouse was not used from 1948 to the 1980s until a group of like-minded people from the communities of Llandysul and Pont Tweli started using the Powerhouse as a Community Centre and the Arts Centre. 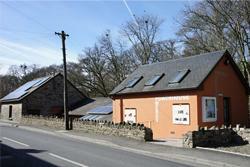 Teifi room: 40 people for talk or film or 10-15 people for a workshop event. It can be used as an exhibition space. Cerdin room: ideal for small informal gatherings, meeting place for a cuppa and a chat will seat up to 12. Computer available for hot desking and a photocopier. Small kitchen area, fridge, microwave, tea and coffee facilities, crockery. 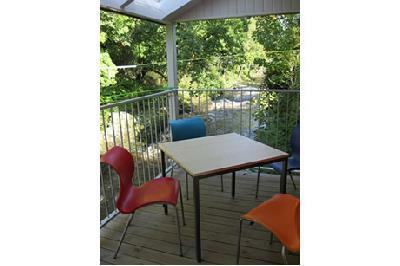 Balcony area: semi covered area, will seat 10 people, cafe style atmosphere, overlooking the river Teifi. Tyweli room: for meetings or lectures, seats up to 20. WiFi access is available throughout the building.